Washington, DC— Bornean orangutans living in forests impacted by human commerce seek areas of denser canopy enclosure, taller trees, and sections with trees of uniform height, according to new research from Carnegie’s Andrew Davies and Greg Asner published by Proceedings of the National Academy of Sciences. Bornean orangutans are critically endangered, and despite intense conservation efforts, their numbers continue to decline. Additional habitat management strategies that account for their presence in forests affected by logging and other human activity are needed to ensure the species’ survival. That’s why Davies and Asner, along with key partners in Malaysia, set out to determine which human-impacted forest areas are most-crucial to preventing orangutan extinction. Their research focused in the Lower Kinabatangan region of Sabah, Malaysia, on the island of Borneo. It consists of forest patches that have been highly degraded by timber extraction, which are sewn into a landscape of palm oil plantations and human settlements. Davies and Asner employed the Carnegie Airborne Observatory’s Light Detection and Ranging (LiDAR) sensor, which uses reflected laser light to image vegetation in 3-D, and combined it with three years of highly detailed field observations of orangutans by co-authors Marc Ancrenaz and Felicity Oram. Because of orangutans’ size, they require strong branches to move laterally through the forest canopy. They can descend and cross large canopy gaps on the ground, but this wastes energy and exposes them to predators. This could explain their observed preference for enclosed canopy, tall trees, and areas with uniform tree height in the human-disturbed forests studied by the team. The researchers had anticipated that areas with a great deal of vertical complexity would be preferentially selected to assist the orangutans with climbing up and down trees. But this proved not to be the case, as lateral movement appeared to be a greater need for the orangutans, based on the scientists’ observations. “In the course of a year, we took the CAO aircraft and team to northern Borneo, mapped its habitats in 3-D, combined the data with Marc’s orangutan observations, and made a critically important scientific discovery that directly bears on the conservation of one of the world’s most iconic ape species,” said Asner, the project’s leader. Like many large vertebrates, orangutans play a particularly critical role in maintaining healthy ecosystem function. That’s why it is so important that they be protected from the effects of human activity on the forests where they live. “Considering that most of the critically endangered orangutan’s habitat is disturbed by human activities, understanding the habitat elements required to ensure orangutan survival in degraded forests is key for their long-term survival,” added Marc Ancrenaz of HUTAN/Borneo Futures, a core project partner. “This orangutan study is another critical piece of information we are assembling to support the Sabah government to determine where to save the most species in this super-biodiverse region of the world,” Asner added. First Image Caption: Photograph of a Bornean orangutan, courtesy of Marc Ancrenaz. A larger version is available here. 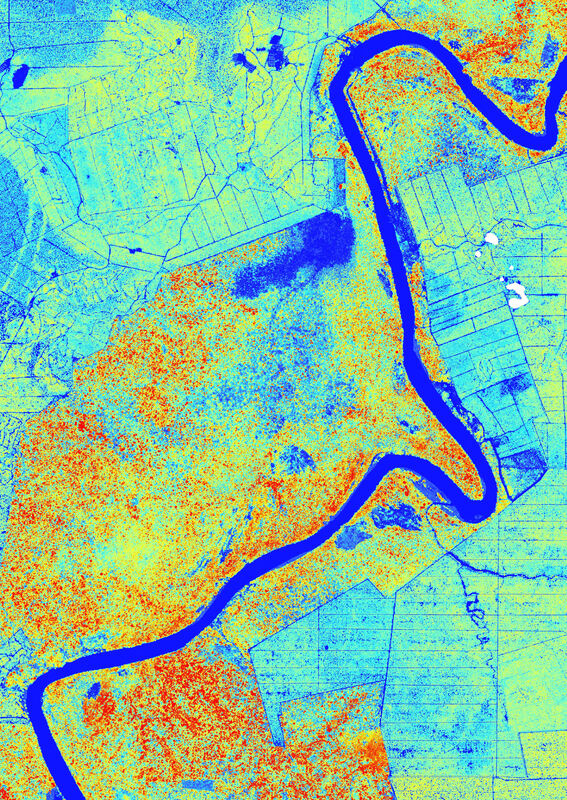 Caption: This image taken by the Carnegie Airborne Observatory’s Light Detection and Ranging (LiDAR) sensor shows forest canopy height as an indicator of forest quality. Areas with red are taller, mature trees. Areas in blues and yellows are forest that’s been degraded by logging. Beyond the forest are oil palm plantations. Image is courtesy of Carnegie Airborne Observatory team. A larger version is available here. 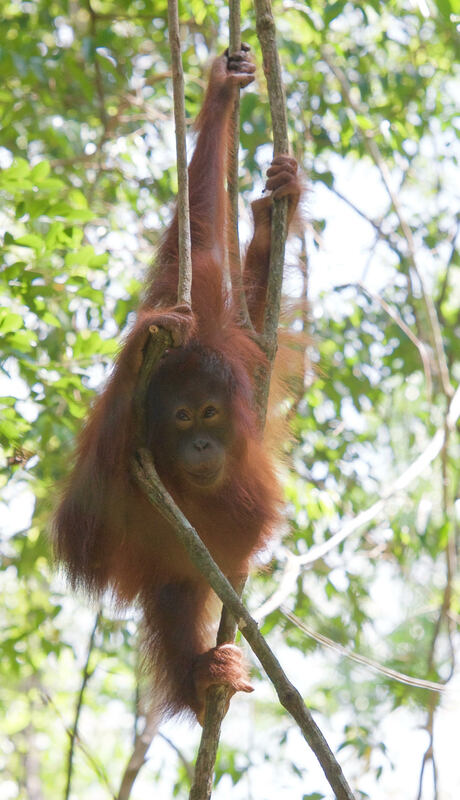 HUTAN-KOCP’s long-term supporters are: Arcus Foundation; zoos of Zooparc de Beauval, la Palmyre, Chester, Woodland Park, Houston, Cleveland, Columbus, Phoenix, Saint Louis, Basel, Apenheul, Hogle, Oregon Metroparks, AZA Great Ape TAG, Australian Project, Synchronicity Earth, USFW, World Land Trust, Waterloo Foundation and other partners.